Fossil hunters have found remains of a probable direct ancestor of humans that lived more than four million years ago. The specimens of this ancient creature are helping bridge a long gap during a crucial phase of human evolution. Professor Tim White of the University of California, Berkeley, and colleagues unearthed the cache of fossils in the Middle Awash region of Ethiopia. They describe the finds, which belong to the species Australopithecus anamensis, in the journal Nature. Australopithecus is an important ancient genus of humanlike creatures, or hominids. Our own genus, Homo, is widely thought to have evolved from this group. So the relationship of Australopithecus to even earlier bipedal hominids is crucial to understanding where we all ultimately come from. When placed together with other fossils from the same general area of Ethiopia, the 4.1-million-year-old anamensis specimens appear to establish an evolutionary succession between earlier and later species. "The fact anamensis is sandwiched between earlier and later hominids is what is really significant about this Ethiopian sequence," Tim White told the BBC News website. The finds close the gap between a more ancient species known as Ardipithecus ramidus, which is found at 4.4 million years and a later species known as Australopithecus afarensis, which is present in the Middle Awash 3.4 million years ago. Australopithecus anamensis is intermediate between the two not only chronologically but also in terms of its anatomy. The anamensis species is not new, but, say the researchers, "this is the first time that these three species have been shown to be time-successive in a single place". One explanation is that one species simply evolved into the other - so-called phyletic evolution. Another possibility is that Australopithecus first emerged as a side branch of Ardipithecus. Under this scheme the mother species would have lived alongside the daughter species for some period of time before the mother species died out. But no overlap between any of the three species has been found in Ethiopia. "I think you could argue, fairly, that the circumstantial evidence based on geography and habitat is of one evolving phyletically into the other and what we're monitoring here is the genesis of that second stage of human evolution - the genesis of Australopithecus," White explained. But, he added: "We cannot disprove the alternative hypothesis just yet." The new discoveries go some way to bridging the gap between Ardipithecus and Australopithecus, but do not entirely plug it. "The gaps don't get entirely filled; you fill a big gap and create two smaller ones," said Professor White. "Now we're looking at a gap between 4.4 million and 4.1 million. That's 300,000 years; an awful lot of time when measured on a human timescale, but not that long on a geological one." The fossils represent at least eight individuals and include the largest hominid canine ever found, the earliest known Australopithecus thigh bone as well as hand and foot bones. The excavation at Asa Issie also uncovered the remains of pigs, monkeys and big cats. The fauna suggest that anamensis was living in a closed, wooded habitat. 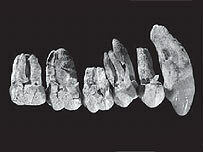 Australopithecus anamensis had a significantly thicker layer of enamel on its teeth than Ardipithecus, suggesting the later hominid was adapting to eating a more abrasive diet of roots. In many species, this is a fallback food when resources are scarce, but it is not clear what caused the diet shift in this case. The Turkana Basin in Kenya has also yielded Australopithecus anamensis fossils. Australopithecus afarensis was first recognised in the 1970s on the basis of the now famous "Lucy" skeleton from Hadar, Ethiopia, and footprints preserved in volcanic ash at Laetoli, Tanzania. Tim White, Gen Suwa and Berhane Asfaw discovered the first Ardipithecus ramidus fossils in the 1990s.